Volunteers can be found in many different roles throughout the Park System. 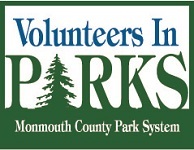 Every year, over 1000 individuals enrich the Monmouth County Park System through their dedication in the “Volunteers in Parks” program. The steadfast support of Park System volunteers contributes to the success of recreation programs, special events, and facilities. Find out more about this volunteer program and how to join by contacting the Coordinator of Volunteers at 732-842-4000, ext. 4283 or writing to: Coordinator of Volunteers, 805 Newman Springs Road, Lincroft, NJ 07738 or email volunteer@monmouthcountyparks.com. Formed in 1991, the Friends of the Parks is a non-profit charitable organization comprised of area citizens and businesses committed to the support of the Monmouth County Park System. In this day and age, when recreation funding must be stretched to meet the needs of a burgeoning population, membership dues, donations, and proceeds from special fundraisers furnish the financial assistance necessary to achieve a number of worthwhile goals. To contact the Friends, call 732-975-9735 or write: Friends of the Parks, P.O. Box 686, Lincroft, NJ 07738. Special People United to Ride (SPUR) is a non-profit organization of local citizens established in 1981. Members assist the Park System in serving individuals with physical and mental disabilities through horseback riding lessons. Students work to improve self-esteem, social skills, balance, muscle tone, and posture as well as to process sensory messages. A dedicated group of individuals works together to staff the Sunnyside Equestrian Center year round. Instructors are certified by the PATH International, the governing body of therapeutic horseback riding. In addition to the staff, over 100 volunteers help with programs every year. Caring, dedicated individuals are needed to work as volunteers. Minimum age to volunteer is 14. For more information about SPUR, please call 732-224-1367, email spur@monmouthcountyparks.com, visit www.spuronline.org. or write to: SPUR, 805 Newman Springs Road, Lincroft, NJ 07738. Monmouth Conservation Foundation is the only county land trust dedicated to saving open space, creating parks, preserving farmland, protecting wildlife, and safeguarding waterways exclusively in Monmouth. Since its founding in 1977, the Foundation has worked closely and collaboratively with the Monmouth County Park System and other municipalities to acquire and expand park lands and natural areas for the benefit public recreation and water quality. The Foundation can be reached by calling 732-671-7000 or writing to: Monmouth Conservation Foundation, P.O. Box 4150, Middletown, NJ 07748.